In July 1614 in Edinburgh, Scotland, was published a small book (fifty-seven pages of explanatory matter and ninety pages of tables) which will make a key advance in the use of mathematics. 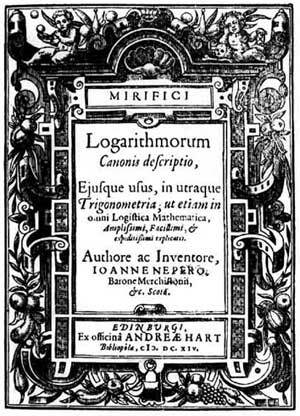 The book was Mirifici Logarithmorum Canonis Descriptio (Description of the Marvelous Canon of Logarithms), written by a Scotsman—John Napier (see biography of John Napier). Two years later an English translation of Napier's original Latin text was published, translated by Edward Wright. What is the history of this remarkable book? There is an indirect evidence that Napier was occupied with logarithms as early as 1594 (in a 1624 letter from Kepler to Petrus Criigerus). Moreover, some historians claim, that there was another man, who invented logarithms before Napier (around 1588), the Swiss mechanical and mathematical genius Joost Bürgi (1552-1632). Bürgi however published his work (Tafeln arithmetischer und geometrischer Zahlenfolgen mit einer gründlichen Erläuterungen, wie sie zu verstehen sind und gebraucht werden können) 6 years after Napier, as late as 1620 in Prague. Described by Bürgi tables distinctly involves the principle of logarithms and may be described as a modified table of antilogarithms. Bürgi's method is different from that of Napier and was clearly invented independently. Bürgi was also an important contributor to prosthaphaeresis, a technique for computing products quickly using trigonometric identities, which predated logarithms and was introduced circa 1005 by Ahmad ibn Yunus al-Sadafi al-Misri (c. 950-1009), an important Egyptian Muslim astronomer and mathematician, and introduced in Europe by Nuremberg mathematician Johannes Werner (1468-1522) in the late fifteenth century. The Constructio is considered to be the most important of all Napier's works, presenting as it does in a most clear and simple way the original conception of logarithms. It seems the concept of a logarithm made it first appearance in ancient Babylonia (just as the concept of the abacus) around 1800 B.C. Baked clay tablets have been found, which contain tables of successive powers of whole numbers. In some of these records a question is asked: "To what power must a certain number be raised in order to yield a given number?" More then 1500 years later the great Archimedes made an observation that is the basis if the modern logarithms—he defined "the order" of a number to be equivalent of the exponent and observed that the addition of orders corresponds to finding their product. In his book Napier proposed a method, which allows the more complex arithmetical operations as multiplication, division and calculating of a root to be done by means of addition and subtraction. He realized, that all numbers can be expressed in what is now called exponential form, meaning 8 can be written as 23, 25 as 52 and so on. What make logarithms so useful is the fact that the operations of multiplication and division are reduced to simple addition and subtraction. When very large numbers are expressed as a logarithm, multiplication becomes the addition of exponents. In the preface of the book Napier explains his thinking behind his great discovery— Seeing there is nothing that is so troublesome to mathematical practice, nor that doth more molest and hinder calculators, than the multiplications, divisions, square and cubical extractions of great numbers, which besides the tedious expense of time are for the most part subject to many slippery errors, I began therefore to consider in my mind by what certain and ready art I might remove those hindrances. And having thought upon many things to this purpose, I found at length some excellent brief rules to be treated of (perhaps) hereafter. But amongst all, none more profitable than this which together with the hard and tedious multiplications, divisions, and extractions of roots, doth also cast away from the work itself even the very numbers themselves that are to be multiplied, divided and resolved into roots, and putteth other numbers in their place which perform as much as they can do, only by addition and subtraction, division by two or division by three . As Napier knew of, and used, the method of prosthaphaeresis, it may well have influenced his thinking, because the first logarithms were not of numbers, but were logarithms of sines. natural numbers 1 2 4 8 16 32 64 128 256 512 1024 .
logarithms 0 1 2 3 4 5 6 7 8 9 10 . It had long been known that if you take any two numbers in the arithmetic progression, say 3 and 4, their sum, 7, would indicate the position of the term in the geometric series that is the product of the terms in the corresponding positions of the geometric series, e.g., 3 + 4 = 7 and 8 x 16 = 128 (the third times the fourth = the seventh). This is starting to look very much like our own conception of logarithms as being the powers to which some base number is raised, a concept that was not understood in Napier's time. Often the use of a good form of notation will suggest some basic mathematical principle. Our use of indices to indicate the power to which a number is being raised seems to have an obvious connection with logarithms, but without this form of notation, the connection is vague at best. 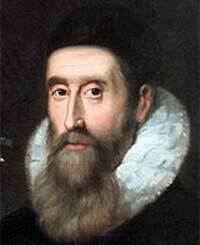 John Napier came at the idea of logarithms not by algebra and indices but by way of geometry. When first thinking about this subject, he used the term artificial number but later created the term logarithm from two Greek words—λoγoς and αριθμός, meaning word, ratio and number respectively. He decided to use this term because his logarithms were based on the concept of points moving down lines in which the velocity of one point was based on the ratio of the lengths of the line on either side of it. Napier, lord of Markinston, hath set my head and hands at work with his new and admirable logarithms. I hope to see him this summer, if it please God; for I never saw a book which pleased me better, and made me more wonder . Briggs immediately began to popularize the concept of logarithms in his lectures and even began to work on a modified version of the tables. Working together with Napier for some time (he was able to visit Napier twice at his baronial estate), later on Briggs will propose that the base of the logarithms should be changed in order to make them easier to use, thus we have 10 based logarithms, and in 1624 published tables, containing the logs of the numbers from 1 to 20,000 and from 90,000 to 100,000 all calculated to 14 decimal places. So, needed logarithm can be found by subtraction of 2 (this is the decimal logarithm of 100) from the logarithm of 793. Of course, the usefulness of the decimal logarithms is due to our decimal numbering system. A Scottish baron has started up, his name I cannot remember, but he has put forth some wonderful mode by which all necessity of multiplications and divisions are commuted to mere additions and subtractions. A year later, Kepler wrote to Napier expressing his admiration and letting him know that he must publish the promised Constructio as soon as possible. Unfortunately, Napier had been dead for two years before the letter arrived. The letter may have spurred John's son, Robert Napier, into putting the finishing touches on his father's notes and overseeing the publication of the Constructio in 1620. In 1624 Kepler published his book Chilias Logarithmorum ad totidem numeros..., creating the logarithmic tables by a new geometrical procedure, the form thus differing from the logarithms of both Napier and Briggs. Within twenty years of the time that Briggs's tables first appeared, the use of logarithms had spread worldwide. From being a limited tool of great scientists like Johann Kepler, they had become commonplace in the schoolrooms of the civilized nations. Logarithms were used extensively in all trades and professions that required calculations to be done. It is hard to imagine an invention that has helped the process of computation more dramatically than has logarithms. Very soon after popularizing of logarithms began attempts for removing of the nasty end error-prone process of looking into tables and manual adding of numbers. First was a colleague of Brigs and professor of astronomy at Gresham College—Edmund Gunter (1581-1626). Briggs's work naturally came to the notice of Gunter, who had some earlier experience in the development of calculating instruments, having been one of the major figures in the perfection of an instrument known as a sector. This experience soon led him to realize that the process of adding together a pair of logarithms could be partially automated by engraving a scale of logarithms on a piece of wood and then using a pair of compasses to add together two values in much the same way, as he would have done when using a sector. Not only did this method eliminate the mental work of addition, but it also removed the necessity for the error-prone and time-consuming process of looking up the logarithms in a table. Gunter described his instrument in the book Description and use of the Sector, the Crosse-staffe and other Instruments, published in 1623. Such a rule is frequently referred to as a Gunter line or Gunter Scale, often combination not only of a logarithmic scale, but also with chords, sines, tangents and rhumbs. 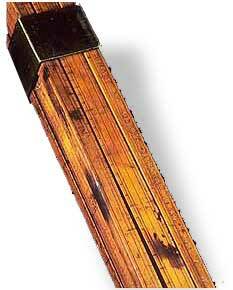 A two foot long boxwood ruler inscribed with a variety of scales was a standard navigator's tool up until the end of the 19th century. After Gunter, several English mathematicians almost together invented some kind of rules. 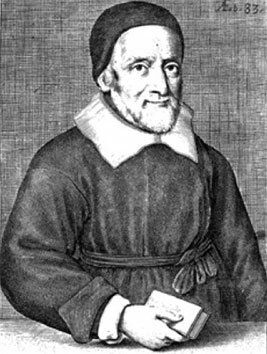 First apparently was a friend of Brigs and Gunter—William Oughtred (1574-1660), a priest and one of the leading mathematicians of his day. Oughtred noted that Gunter's Line of Numbers required a pair of dividers in order to measure off the lengths of logarithmic values along the scale and quickly came up with the idea that, if he had two such scales marked along the edges of the pieces of wood, he could slide them relative to each other and thus do away with the need for a pair of dividers. He also saw that if there were two disks, one slightly smaller than the other, with a Line of Numbers engraved around the edge of each, that they could be pinioned together at their centers and rotated relative to one another to give (so called Circles of Proportion) the same effect as having Gunter's scale engraved on two bits of wood (see the lower drawing). Oughtred invented the rectangular movable slide rule and the circular slide rule around 1622, but published the description as late as 1632 (in the book The Circles of Proportion and the Horizontal instrument), thus giving the chance of some other others to outstrip him. Oughtred probably described his devices to one of his pupils (Oughtred taught mathematics at his residence, without compensation, to promising pupils), Richard Delamain (1600-1644), who was a teacher of mathematics, living and working in London (he was a private tutor of mathematics to Charles I, King of Great Britain and Ireland). 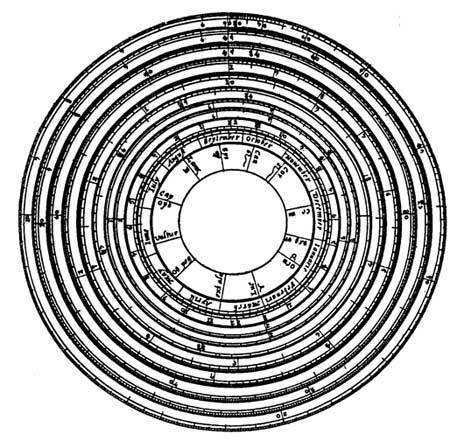 Delamain, described a circular slide rule in a 32 page pamphlet Grammelogia which was sent to the King in 1629 and published the following year. This led to verbal disputes between Oughtred and Delamain, as each combatant accuses the other of stealing the invention of the circular slide rule. The first description of the Gunter's logarithmic scale in the form of a plain scale was published in 1624 in Paris by the mathematician Edmund Wingate (1596-1656). Wingate included a copperplate engraving, measuring 25 inches in length, of Gunter's scales. In 1628 Wingate published an English translation of this work with the title The Construction and Use of the Line of Proportion... This book contains a double scale, on one side of which is a logarithmic scale, on the other a tabular scale. One simply reads the logarithm of a number on the logarithmic scale by examining the proportional scale next to it. This is not yet a contemporary slide rule, since it has no moving parts and is not a Gunter line, since one does not perform calculations with the aid of pair of compasses: it is simply a diagrammatic substitute for a table of logarithms. The earliest known dated slide rule (which uses wooden scales bound together with metal bands), is the rule of Robert Bissaker, manufactured in 1654 (see the nearby photo). It is about 60 cm in length, with section about 6 sq. cm and consists of 3 wooden scaled plates, as the 2 outer plates are fixed by means of a copper frame, while the inner plate can be slide between them (see the lower photo). It seems that the idea of the slider (called also cursor or runner), important element of a contemporary slide rule, first came to the great scientist Isaac Newton (1643-1727). In 1675 Newton demonstrated a way for solving of equations from the third degree, using 1 unmovable and 3 movable logarithmic scales and a slider. As a element of the slide rule however, the slider appeared 100 years late in the rule of mathematician John Robertson (1707–1776). In 1775 he added the cursor or runner, which allowed setting to be transferred to any of several parallel scales, as well as holding a position while the slide was moved. The English inventor James Watt, known for his work on the steam engine, was responsible, at least in part, for one of the first really well-made slide rules in the end of 18th century. He devised a simple slide rule consisting of one sliding piece between two fixed stocks (a design that had been in use for a considerable period of time), carefully engraved the face with four basic scales, and put tables of various constants on the back. His rule was accurate enough that others soon requested copies for themselves and Watt manufactured this so-called Soho Slide Rule for several years (see the lower photo). Victor Mayer Amédée Mannheim (1831-1906), an officer of the French artillery, invented in 1850s what may be considered the first of the modern slide rules. He designed a very simple slide rule much like that manufactured by Watt, but added the movable double-sided cursor, which is a integral part of the slide rule today. Mannheim's design was adopted as the standard for the French artillery and, after a few years, examples of it began to appear in other countries. Once established, the progress of the slide rule was extremely rapid. Many different forms were produced by several different major manufacturers. The number of scales to be found on each instrument increased to the point that eighteen or twenty different scales were regularly engraved on the better quality instruments. Both sides of the rule were used and the center, sliding portion could often be turned over or completely replaced to provide even more combinations of scales. Special slide rules incorporating such things as a scale of atomic and molecular weights were created for chemists, and almost any branch of science or engineering could boast that at least one manufacturer produced a slide rule designed for their particular use. The accuracy of the slide rule was improved by several people who modified the basic form so that the logarithmic scales were wrapped around cylinders or into spirals. One device, known as Fuller's Slide Rule (see the lower figure), invented by the Professor of Engineering at Queen’s College Belfast George Fuller in 1860s (US patent No 219246 from 1879), was equivalent to a standard slide rule over eighty-four feet long, yet could be easily held in the hand. It was possible to work correctly to four figures, and sometimes even five, with this particular unit. A similar as Fuller's slide rule was made by Edwin Thacher of Pittsburg, Pennsylvania in 1870s. 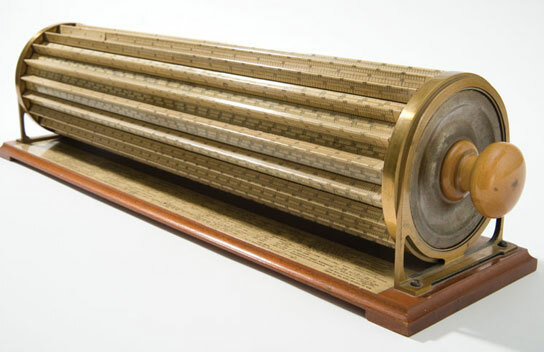 Placing the logarithmic scale on a drum and series of crosspieces, the Thacher functioned like an 18-meter slide rule for calculations up to five significant digits. Inventor Thacher patented it in 1881 (see US patent 249117). This one (see the lower photo) was manufactured by Keuffel & Esser of New York around 1887.